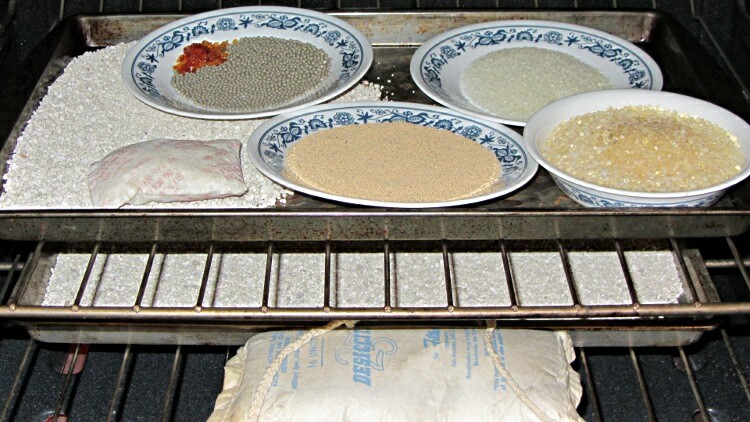 The granules in the trays go into sealed glass jars, where they will remain dry until needed. The assorted beads & kibble in the plates get bagged up and go in the fireproof safe along with the big bag in the front, where they ought to be good for maybe half a year. It’s a new safe, so we’ll see how that works out; I tucked a note with the weights inside the safe. I found a “sealed” plastic bucket of assorted packages that I’d dried and weighed a decade ago and then lost in the back of the shelf. It had gained 2 ounces, but the packages have rotted out and the beads weren’t in good shape; they were the consumer-grade bags that aren’t intended to be dried and reused.